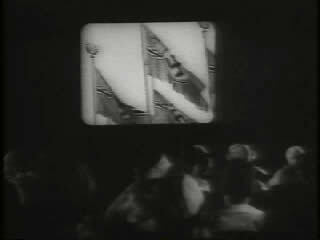 (3) Abbe Lambert "dangles before uneducated natives hypnotic promises of prosperity" (4) "From cinema screens throughout the land, Europe's fascist leaders make new converts." (5) Ships wait at Algerian ports. Trouble foments in Algeria as the French fear a war with the Italians over their Mediterranean colonies. The March of Time's pieces on the Mediterranean address the role of colonialism and the constant struggle over the hearts and minds of those native to the colonies; natives outnumber the French but are much poorer than French colonists, creating a tension easily exploited by the enemy. Despite political troubles and a despression, France's biggest problem may be "the emergence of a new Roman empire in the Mediterranean." Mussolini claims the Mediterranean for himself, and areas around it as his own. 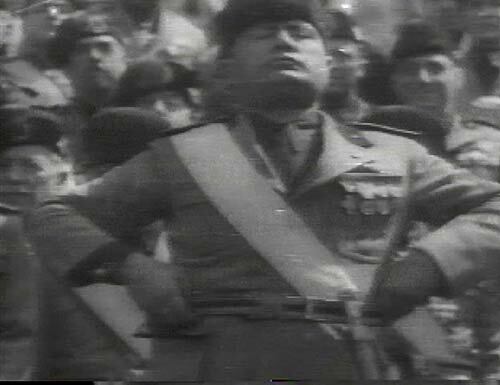 Il Duce has found success in Italian Libya, where millions of Muslims were indoctrinated with his fascist creed, the narrator says. "Today France finds hostile forces entrenched on both sides of her rich Algerian territory," with Mussolini "tightening [his] grip" on the French lifeline to Algeria, the Mediterranean. 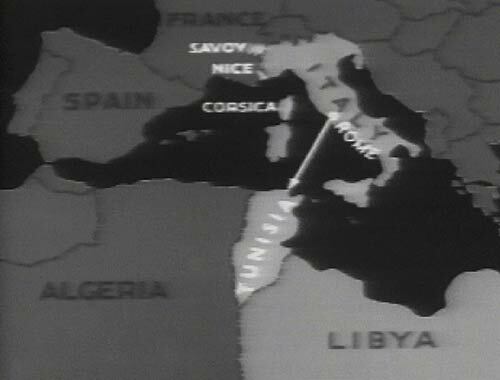 An intertitle notes, "As France lines up with Great Britain to protect common interests in the Mediterranean, Algeria assumes strategic importance in Europe's troubled affairs." Algeria is four times bigger than France, but with a tactful mixture of might and tolerance, France has "kept 6 million Muslim natives well in hand." In the Algerian assembly, 800,000 white colonists dominate, wealthy from agricultural profits and land reclaimed by irrigation. The French colonists are "masters over the poverty-stricken natives who labor on the enormously productive plantation." In wartime, France depends on Algeria as a source of manpower as well as supplies. "Today Algeria's natives, driven off lands they once used freely, reduced to peonage, are not satisfied. With discontent growing, leaders have arisen among them to start a full-fledged native movement, demanding either native independence, or their own voice in the government." They appeal to one French official who listens, and sponsors the Violette Bill to enfranchise thousands of natives. 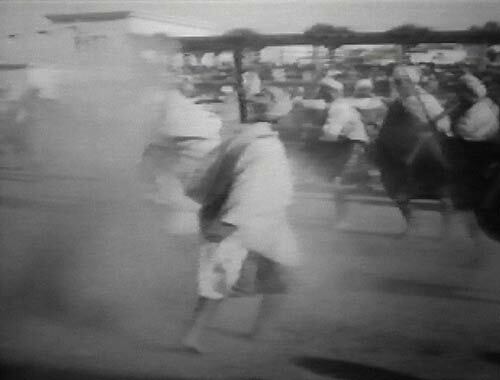 Intertitle: "Quick to oppose the Violette Bill are Algeria's landowners, who see in it a threat to their political dominance over six million Moslems." Colonists, eager to retain power, welcome the arrival of French fascists who have been rebuffed at home. Col. Francois de la Roque espouses fascism, as does Jacques Dorio, who builds up a big following in Africa, "even among natives who understand little of political issues, but like a good show." 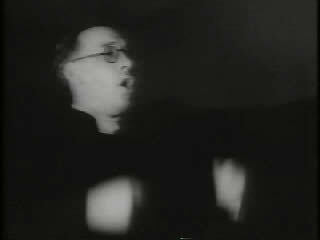 Abbe Lambert, a disowned priest, is a central figure of a fascist organization that has quickly grown. "He dangles before uneducated natives hypnotic promises of prosperity, plays upon their traditional hatred of the Arab for the Jew. From cinema screens throughout the land, Europe's fascist leaders make new converts. Overnight, signs appear, 'down with the Jews.' Then murderous riots break out among the native factions." The French Foreign Legion, which will defend Algeria if necessary, is French in name only—65 percent of the Legion are alien nationalities, professional mercenaries. Will they be patriotic enough to defend French interests? France makes a pointed display of strength. The greatest air fleet ever sent out of France is dispatched for maneuvers over the troubled territory, and their fleet is based in an Algerian port. "Today, France is well aware that fermenting in her North African possession is the same inspired disaffection, which for lack of a firm policy, wrecked her neighbor Spain." The Italians proved more effective in winning support from Arabs through radio propaganda, in seeking support and control of the Mediterranean, an important British waterway. The medium offered another way for Italian aggression to act. 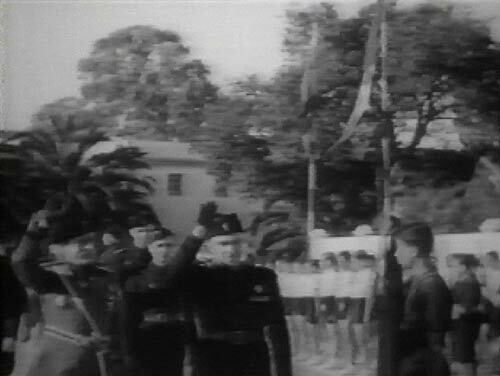 In the opening scene, a parliamentarian declares that Mussolini is "deliberately fomenting Arabian revolt by violence throughout the British empire." Great Britain will start its own broadcasts, and "without stooping to propaganda, we are designing programs and entertainment, certain to appeal to all Islam." Except they don't, as a dramatization emphasizes. Arabs cluster around a shining new British radio, which plays swing music. Shouts of "no more!" are heard in the background over the music. "What kind of music is this?....what man can understand words of the English?" an Arabian man complains. They turn the dial to an Italian channel, which plays Arabic music, and are more pleased with the fare. The Voice of Time explains, "Up and down the Holy Land, 20-odd-thousand radios tune out Great Britain, tune in the enemy." Britain's radio offensive flounders, and Italian radio becomes the "Bing Crosby of the Far East." Again The March of Time's focus turns to the Mediterranean, this time to Gibraltar, the gateway to the Mediterranean. This episode indicates the area is beset by fascists bent on taking control of the Mediterranean, and paints them as a threat to the freedom of the people there, while the Rock of Gibraltar represents the a bulwark of democracy. 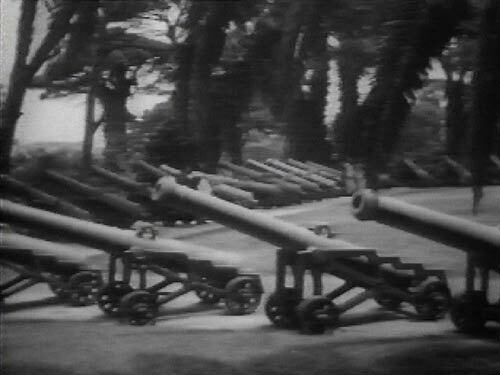 The title sequence with cannons indicates the area could face war. The Tangiers territory, 40 miles from the Rock of Gibraltar, belongs to no one nation. But for more than two centuries Great Britain has guarded its lifeline to the east and their sovereign control over the Mediterranean. Now Great Britain is sending reinforcements because "her proudest fortress is all but engulfed by Europe's rising tide of fascism." 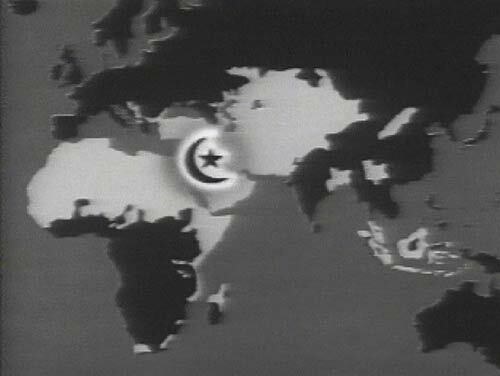 Tangiers may become the scene of a fascist uprising among hostile Muslim natives. 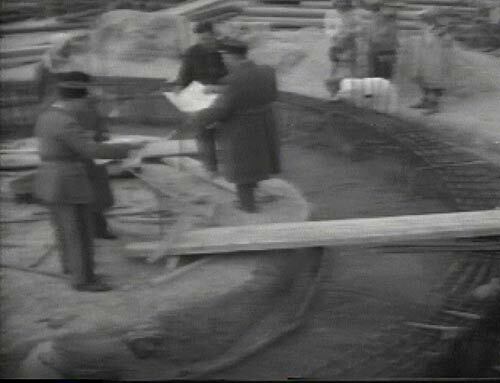 An intertitle explains,"Because of Tangier's potential military importance in the Mediterranean, both England and France have long contrived to keep its people friendly and dominate its local government." Local native leaders are "puppets" who take orders from the government of Europeans. France, long haunted by the nightmare of Muslim revolt, has tried to be friendly. As long as France maintains its prestige and power, the Voice of Time speculates, England has no fears. 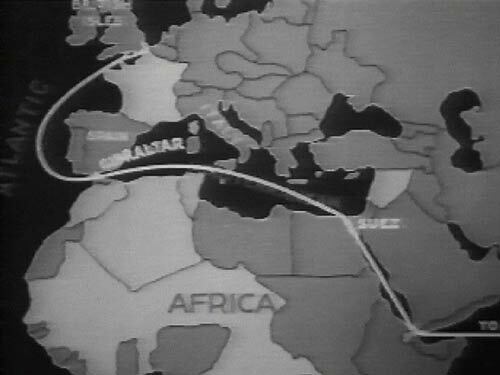 Intertitle: "Today, with Spanish and Italian fascism spreading throughout North Africa, neutral Tangier has become a base for international intrigue and propaganda. "Today a neutral and unarmed territory, Tangier is entirely surrounded by the fascist war zone." 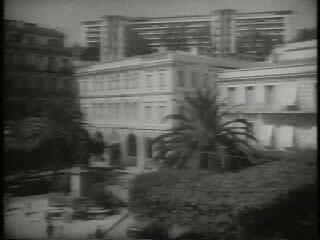 Tangier's legislative assembly has been the scene of many nationalistic quarrels in the past few months. The "busiest European ligation in Tangier today is that of Italy, whose minister must impress upon Moorish natives that Benito Mussolini has declared himself a protector of all Muslims, and the loyal ally of their neighbor, General Franco." Fascists based in Spanish Morocco have been kidnapping loyalist fishermen and keeping them as POWs, forcing the fishermen to remain in port. Appeals to the loyalist Spain minister to Tangier, Del Rio, are to no avail—he is under internment and being closely observed by fascists. A new statute allows for the arrest of communists, so Spanish loyalists are getting kicked out of the territory. 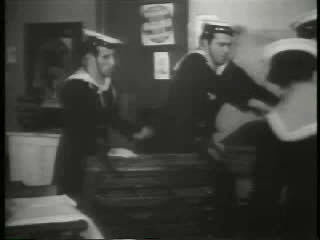 Italian sailors on shore leave "have demonstrated their fascist brand of patriotism at the printing plant of the local Spanish newspapers, the loyalist La Democracia"—by destroying the printing plant during two visits to shore. Fascist police lecture and fine the newspaper editor, "not the rioting sailors." 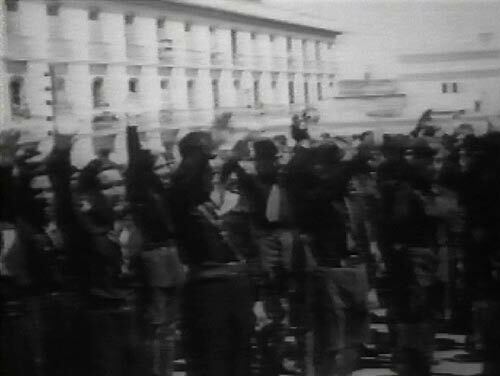 Although civil organizations are forbidden to hold military demonstrations, "Spanish and Italian fascists, side by side, have found ways to provide the natives with the necessary parades and displays of fascism." 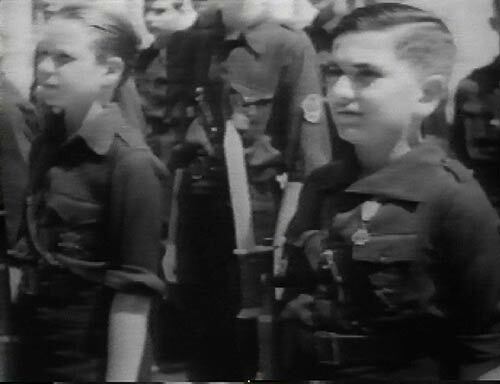 [The film shows images of boys saluting.] 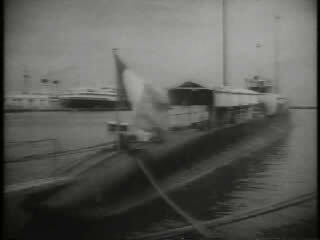 More recently, Nazi submarines have come into port from duty in the Spanish war zone. In Ceuta, Morocco, only a few miles away and closer to Gibraltar, Nazis are building shore batteries, "equipping them with long-range guns. "With their alliance now more firmly sealed than ever, Europe's two great democracies, England and France, are determined that Tangier shall remain in today's European struggle, an unfortified international zone. For only 40 miles away across the straits, is a vital bulwark—not only of the British empire but of democracy itself [my bold]—England's Rock of Gibraltar." The film alternately offers France, England, and the Rock itself as bulwarks of democracy against a "rising tide of fascism." What will happen if those bulwarks fall, the filmmakers wonder? The March of Time gives similar treatment to Tunisia as it did to Algeria, and the elements offer the same story: a Muslim population that outnumbers rich, white colonists; a fascist movement that collects local support; and Italians who undermine the local government to pave the way for their own rule. The Muslim empire numbers 200 million people who "are by their very numbers and their religious unity still a force in the world today. For Europe still dreads the possibility of a Holy War." Natives desire self-government, "largely inspired by fascist Italy, just across the Mediterranean." The narrator cites an Arab revolt against Jewish immigration into Palestine. "Openly sympathetic to this Muslim uprising is the same influence: fascist Italy." Italian penetration "has created a political force opposing everything British" in Egypt, but to them the Suez Canal is a "vital trade route." There is scarcely a harbor in the Mediterranean "that does not shelter men of war," and the battleground may be shifting from Europe to the Mediterranean colonies. 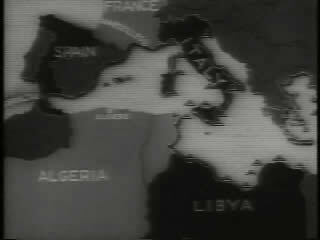 An intertitle notes that "Chief character in any Mediterranean crisis of 1939 will be Europe's No. 2 sword-rattler—Benito Mussolini." Italian-controlled Libya has already converted to fascism. "Mussolini is purposely seeking more converts, for his ambition is a new and mighty Roman empire, encircling the Mediterranean as in the days of the Caesars and ancient Rome." The Franco revolt would be "doomed to failure but for Italian support," the narrator points out. Italy gained its greatest strength in 1938 at Munich: "the pledge that for services rendered, German arms would be rendered when needed." With 1 million trained soldiers and its powerful navy, "Italy is in a position to execute its plan for Mediterranean conquest." Intertitle: "Of all Mediterranean plums, none is so tempting to land-hungry Italy as France's North African protectorate—Tunisia." For nearly 60 years, Tunisia was "reasonably contented." The country is fertile—a major producer of olive oil and fertilizer, it may also have oil. Tunisia has "strategic importance in a major Mediterranean war" and could "make Rome again master of this sea." The French employ a Muslim figurehead, who, in return for his keep, is supposed to ensure that the Muslim population is content. The "fascist imperial state of Italy" has sent advance men sent into Tunisia, so that there are more Italians in French Tunisia than in all African colonies. "Well supplied with fascist funds, Italy's consuls and their agents have long been busy systematically undermining French influence of authority." Italian banks are generous to Italian colonists, Italians have their own schools loyal to the fascist state of Italy, and many Tunisian newspapers are subsidized by Italy. Professional agitatators "are actively encouraging trouble, magnifying grievances, imaginary or real." Radio programs tell Muslims that Mussolini alone is their protector. Membership in the Fascist Party is all but compulsory for every Italian male in Tunisia, and refusing to join means virtual banishment. The March of Time points out the irony that democracy allows dissent to flower: "Granted free speech and free assembly by French law, fascist leaders in Tunisia have become loud and aggressive in demanding special privileges for Italians, at the same time denouncing the French government, which tolerates their activities." [The show does not explicitly state that rampant inequality between natives and whites has allowed dissent to flower as well.] Italy is making buildings that are easily convertible to military use, and building up the civil population to support a mass takeover. Ominously, Mussolini "names 1939 as Italy's year of conquest and expansion." Italians conduct well-rehearsed "spontaneous" demonstrations demanding more land. Italy demands Corsica, Djibouti, Nice, Savoy, and Tunisia. British Prime Minister Chamberlain meets with Italy, "whose appeasement at Munich cleared the way for Mussolini." French fighting planes go to Tunisia to protect the colony. The French navy fleet is still bigger and more powerful than Italy's, and the French army digs in to reinforce the line. Muslim minarets serve as warning towers in air raids. "France is determined there will be no Mediterranean Munich," the narrator intones, and the nation will prove it "can still match the might of a European warlord."